How much energy is in a Gummy Bear? It is possible to push a bamboo skewer right though a balloon with out popping the balloon! Check this out! This demonstration has been done for over 2,000 years! Non-the-less there are still incorrect explanations of the science being published and distributed today. Combine some iron oxide (rust) with a little aluminum and you get some really nice sparks as well as some microscale chemistry. 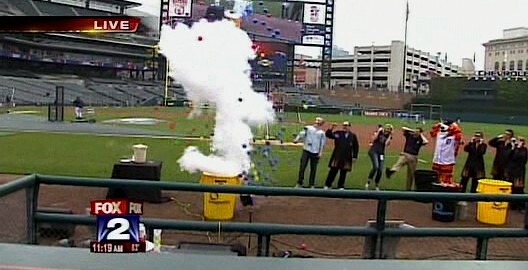 At Comerica Park in Detroit, as part of Weather and Science Day, we see what happens when a gas expands inside a closed bottle! Combine whole milk, some food coloring and dish detergent to create some cool color mixing patterns. How can you get a egg inside jar that has an opening smaller than the egg? You can extract DNA from fruit using just stuff you have in your bathroom and kitchen. How to make a cloud with liquid nitrogen and warm water. Making a Naked Egg is really simple and some pretty cool kitchen chemistry, check it out!